Reasons why Mobile Wallet Is the Best Place for Digital Membership Cards! Home/Blog/Reasons why Mobile Wallet Is the Best Place for Digital Membership Cards! We all are familiar with the standard plastic/physical membership cards. It just has the membership number, the image of the member and the address with few other short details. Why we are talking about this is to let you know how the people out there are using the mobile wallets for every basic thing. All the more, it has made the lives easier. So why not use the channel for your Membership Cards- a transition from plastic to digital? Trust me, doing so you are going to unlock a completely new and enhanced way of member engagement. You can provide your members the cool features like push-notifications, automatic renewal reminders and so on. This post will show you how considering Digital Membership Card (Mobile Wallet) can help you reduce the cost associated with membership process that includes- card printing, stuffing envelopes, mailing, supplies and staff time. 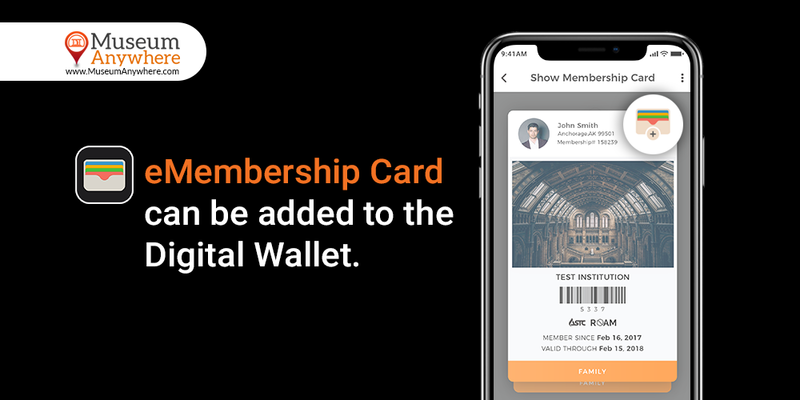 The Digital Membership Card app features- ‘Add to Wallet’ which lets your members stay away from the hassle of going into the app again and again. So this is a better way to provide ease of access to the card to your members. Although our Digital Membership Card app has institutions from which the member can select, imagine what if your member runs out of space in their mobile phone, what is the next thing they would be likely to do? They would think of deleting few apps. So here is when they can leverage the ‘Add to Wallet.’ By adding the membership card wallet to the app, they can delete the app if they want to, but will still be able to have the access to the membership card. Also, if the card gets expired, the member can get it within few hours with automatic renewal with just few clicks. Wallet card pops up on member device, as soon as member comes in the vicinity of the museum. So which one you would like to provide to your members- a six-step or a two-step process? Try it for once. How about taking a jump from plastic cards to digital membership cards? Do you have more queries that we didn’t cover here? Get in touch to find out how digital membership cards can benefit your museum. Previous Previous post: Why Should Plastic Membership Cards go digital?